Well, the season is upon us. Yet, somehow, it never really feels like Christmas when it's so warm and sunny out, does it? Having said that, I was quite impressed when talking to a friend of mine recently. His little daughter had asked Santa for a rocket and an air plane. And, rather incredibly, Amazon has water rockets and remote controlled planes. I suspect that there will be one very happy girl come Friday morning! So perhaps it does feel a bit like Christmas. I'm sure some mulled wine and mince pies will help. I wonder if brandy butter is available here? More importantly, I wonder what this water rocket is going to be like?! Something that always helps to get into the seasonal swing of things are parties! 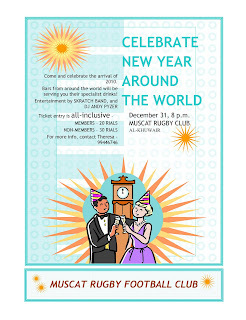 The rugby club have two events this year, one on the 23rd, the other on the 31st. 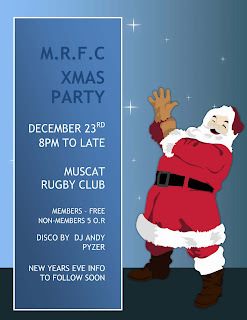 The Christmas party, on the 23rd, is free for members, and only RO 5 for non-members. On the 31st, for NYE, the prices are RO 20 for members, and RO 30 for non-members, and that includes an open bar for the entire night, along with food as well. Not bad when comparing to the hotels tickets, which are in the region of RO 60-65 a ticket. The Skratch band will be playing at the club for NYE as well.